The U.S. Army's drone armada alone has expanded from 54 drones in October 2001, when U.S. combat operations began in Afghanistan, to more than 4,000 drones performing surveillance, reconnaissance and attack missions in Afghanistan, Iraq and Pakistan (pdf). There are more than 6,000 of them throughout the U.S. military as a whole, and continued developments promise to make these controversial aircraft—blamed for the deaths of militants as well as citizens—far more intelligent and nimble. From 54 drones in 2001 to the current 6,000 in-stock, within 10 years of 9/11 the US Army saw a net increase of their drone arsenal by 11,000%. The legislation would order the FAA, before the end of the year, to expedite the process through which it authorizes the use of drones by federal, state and local police and other agencies. Section 332 of the new FAA legislation also orders the agency to develop a system for licensing commercial drone flights as part of the nation’s air traffic control system by 2015. The provision in the legislation is the fruit of “a huge push by lawmakers and the defense sector to expand the use of drones” in American airspace, she added. The agency projects that 30,000 drones could be in the nation’s skies by 2020. This new bill follows up the Army's January directive to use drone fleets in the U.S. for training missions and "domestic operations." And both of these initiatives are mandated in the NDAA (section 1097) that calls for six drone test ranges to be operational within six months of that bills signing December 31. The commercial drone market would be worth hundreds of millions more if the bill passes. Northrop Grumman, Raytheon, Lockheed Martin and many other 'Corporate Partners' are poised to profit heavily from the legislation. They are the Association for Unmanned Vehicle Systems International or AUVSI, a conglomerate of 'defense' companies that essentially lobbied for and drafted HR 658. In addition, major manufacturers like Northrup Grumman spent tens of millions lobbying last year. 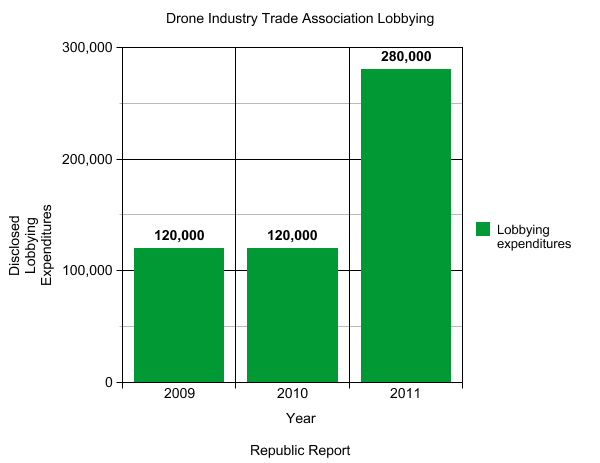 These lobbying expenditures covered the FAA drone expansion law, but also encompassed other military related legislative items, making a more comprehensive look at drone lobby spending more difficult to pin down. What will the drones be doing in the US? Afterall, 30,000 drones in US airspace is still many thousands more drones than is currently employed to fight wars throughout the World. In late 2011 MSNBC reported that since 9/11, 30,000,000 cameras have been installed throughout the streets of the US. Rasmussen Reports released stats that show the approval rating for Congress has slipped to a historic low of 5%. Obama recently signed the NDAA which allows for the detention of US citizens, without due-process. Could it be that concerns beyond privacy are reasonable? grumpy brian on Tue, 02/21/2012 - 2:02am.